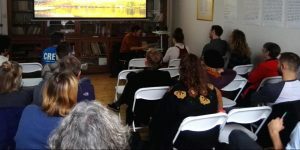 Music is hugely important to any film and in the second of the Cultivator Cornwall’s skills session during the Festival Connie Farr provided enlightening guidance into her niche within the market of music licencing. An area which is little known for most up and coming directors, producers and filmmakers. During her talk, Connie also highlighted the complexity of negotiation, legality and budget considerations which make up a small but essential cog within the lifecycle of a film. Raised in Falmouth and an attendee of Falmouth School of Art, Connie is the founder of Think Sync Music. Specialising in soundtracks for short film, features, TV, games, advertising ThinkSync Music are a one-stop music supervision, consultancy and licensing service for Films, Trailers, TV, Advertisements and Promos who provide music with character and individuality. Sourcing is a vital specialism of the service within her company. Finding the right track for her projects has played a crucial role in the success of many films, trailers and promos. Connie’s honest advice to start this essential part of the process at an early stage in the evolution of a film, should not be forgotten as it can make or break a film success wise as well as budget wise. Her insightful talk into her world of licensing, master rights, terms and territories would, which would without doubt be a minefield for anyone not experienced as she is, gave us all food for thought for our future projects.